The Victoria Falls is neither the highest nor the widest waterfall in the world. However, it is classified as the largest. This is based on its combined width of 1,708 meters and height of 108 meters which result in the world’s largest sheet of falling water. In height and width Victoria Falls is rivaled only by Argentina and Brazil’s Iguazu Falls. The Falls is one of the most spectacular natural wonders of the world and certainly a “must see” destination. The best time to visit the spectacular Falls is from February to May. This is after the region’s summer rains when the water level is at its greatest volume. The Falls is roughly twice the height of North America’s Niagara Falls. The sheer force of the water drives a column of spray far into the air with a thunderous roar. Victoria Falls town (in Zimbabwe) lies on the southern bank of the Zambezi River at the eastern end of the falls themselves. The Airport is 18 km south of the town and has international flights to Johannesburg (South Africa) and Windhoek (Namibia). Livingstone (in Zambia) is a historic colonial city and tourism center for Victoria Falls lying 10 km south on the Zambezi River. It is a border town with road and rail connections to Zimbabwe on the other side of the Falls. The Airport has international flights to Lusaka and Johannesburg in South Africa. View Accommodation options in Zimbabwe with guest ratings, grading and rates – request a quote and book online. See also the options for Accommodation in Livingstone across the river in Zambia. 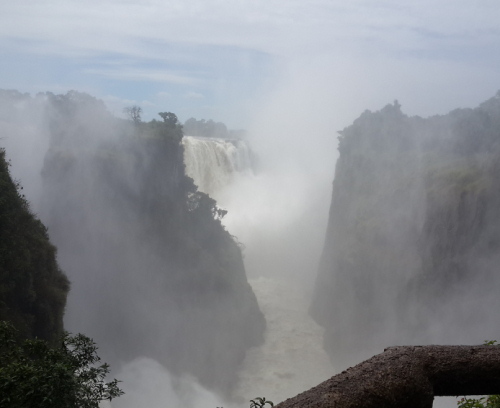 As alternative you can consider booking a tour to the Victoria Falls from Johannesburg.